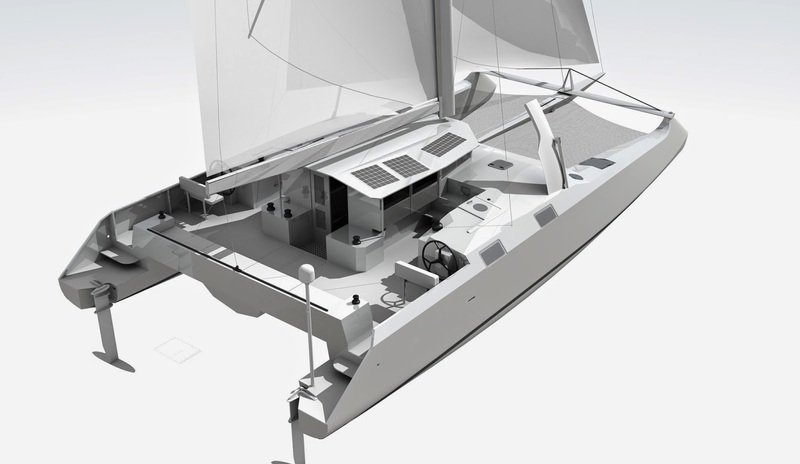 It may look a bit like vaporware from a futuristic basketcase, (and it certainly isn’t going to win any ‘Prettiest Yacht Awards’) but in fact this is nothing of the sort; it’s a 53-footer from the desk of ultra-fast BMW/Oracle/Team USA alum Paul Bieker, it’s already under construction at Gold Coast Yachts in the Virgin Islands, and it’s a ‘high-performance cruising cat’ for the Seattle-based wners of the current J/125 Hamachi, though the new fish will begin her career racing in the Caribbean. 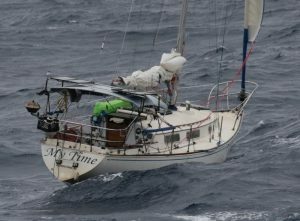 For more on the boat or to ask the new owners about it, head to the Bieker blog, and then over to the thread; or just read on. Bob Perry’s been doing design reviews in magazines for decades, so let’s follow his lead; here’s a review of the design from one of Sailing Anarchy’s most verbose designers, Chris Ostlind. Personally, I like that Paul and Eric have pulled design cues from Polynesian boats while subtly mixing the forms with modern thinking. The raised Manu forms at the bow tips are very definitely Polynesian in execution and I feel that they serve both functionality, as well as providing a counter point to the same conformed styling we see in so many boats derived from “conventional wisdom” ideology. There is a distinct, wave piercing capacity in the bow forms, while not giving away that precious interior volume that a cruising cat needs to provide the kinds of creature comforts that are the hallmark of a great cruising cat. The Manu shape at the bow gives a pronounced cutwater shape that parts oncoming seas and that philosophy holds down the length of the bow as it makes use of the beveled edge that gracefully submits to the need for a flat surface for going forward safely. That same shape enhances aero efficiency by allowing the wind and water to slide over the form rather than be forced to make abrupt changes of direction, which guarantee form drag losses. The shapes also enhance the strength of the bow through styling engineered geometry and that can ultimately save laminate weight in the build and potentially help with costs, while reducing weight in the ends of the boat. All kinds of thinking strata involved here. The riskiest component of the design, to me, is the incorporation of C-boards to give foil assist. At typical cruising speeds and realities, these boards are maybe a nod to current fashionable ideas more than they serve as a real boost to sailing that most cruisers are not going to be doing while underway. That’s another argument for another time, though. I get that the shapes of the boards can be incorporated into the hull shapes with a beneficial result on interior volume, so perhaps that is really what the creators are after here and the lifting foil aspect simply came along as an interesting side application. 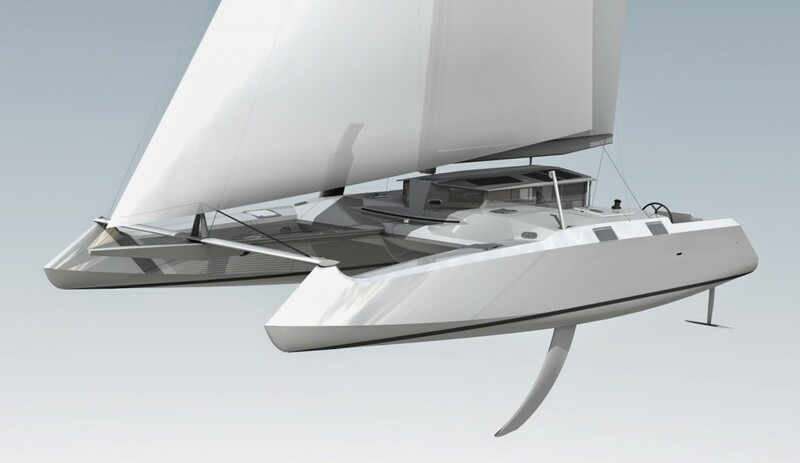 The T-foil rudder are definitely a good idea for a cruising boat as they allow for a more stable ride overall with little of the penalty issues that the forward boards entail. The deck house is a nod towards the history of the Polynesian voyaging Cat, to be sure and I fid it refreshing in its approach and as a counter point to all the Space Station looking cats we see in huge numbers. I find the uniqueness of this take on a design to be a terrific statement in stepping away from the drudge of “me-too” cat design that tends to make all the boats in the marina look like Accords and Camry’s… and it gets the sailors out into the elements a bit where they can enjoy much better forward vision and a sense of really being able to look around and take in what is happening to their boat in the environment. Yes, it’s going to take a real special person to own and operate this boat, but I think that’s exactly what the design team were shooting for. Something interactive, rather than simply another layer of structure that typically stands in the way of the experience of sailing in the weather, sun and wind. A lot of existing cats of this size are like tooling around in a medical waiting room, where this boat will be putting the owner, sailor directly back into the place where it all started several thousand years ago; definitely an attempt to reconcile our collective willingness to encounter a sterile sailing experience and call it good. A pleasure to behold and contemplate.